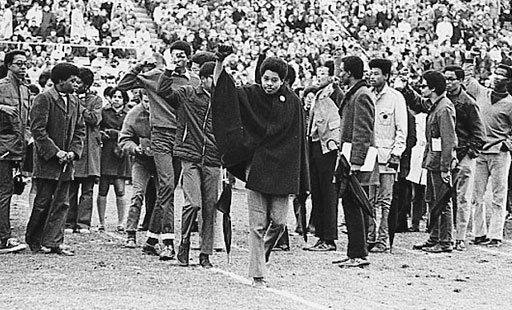 The Black Student Union articulated their demands and grievances at halftime of a Penn State football game. “Since we cannot reach you at any other place, we find it necessary to come to a football game to ask you to think as members of an academic community. We wish to express an analysis of our situation, and we ask you to join us in these thoughts,” stated the group spokesperson. At the end of the 8 minute speech the Blacks marched off the field single file, with fists held high.